Going on the assumption that the presidential campaign will indeed continue (whether John McCain participates or not), we turn back to the polls to get a sense of what's going on out there. Now, today was a banner day for Obama in the national polls (especially the one that puts him up nine points, 52/43) -- but they are largely meaningless, since that is not how we elect our president. Given the facts of the Electoral College, we have to go down to the level of the state polls to more accurately judge the race. Since last week's dismal outlook for Obama, there has been an absolute flood of state poll numbers released. One day after last week's column ran, over thirty states released polls on the same day. Whew! They even polled the District of Columbia, for the first time in the entire election season (you can see why they hadn't bothered up until now -- it unsurprisingly came out 82/13 in Obama's favor). But so many state polls are being released so fast, that for the first time every single state has been polled recently -- and not just in the past month, but in the past week. This flood of data is a good thing, though, as it keeps the electoral map a lot closer to the current voter preferences state-by-state. Before we begin, a quick overview of the states that have moved categories. McCain firmed up his lead in two states, Texas and Arizona. He stole New Hampshire from Obama as well. But he lost ground on five states -- Florida, Louisiana, Montana, North Carolina, and West Virginia. Meanwhile, Obama captured New Mexico and Virginia back from McCain, and increased his lead in four other states -- New Jersey, New York, Pennsylvania, and Washington. But he lost ground in a few states as well -- Iowa, Maine, and Wisconsin. The overview of each candidate's electoral percentage starts at the bottom for Obama (blue) and the top (red) for McCain. Ties are in white. 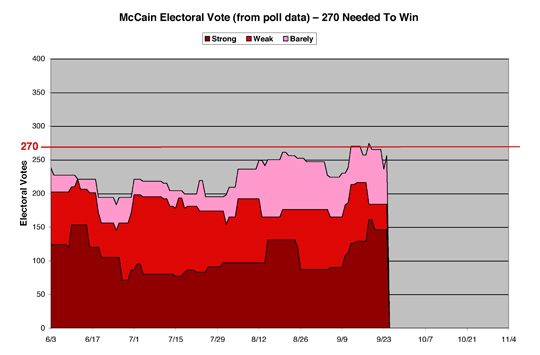 McCain started the week with 257 electoral votes (EV), for 47.8%. He briefly spiked up to 50.9% the next day, then sunk down to a low of 43.9% before fighting back to almost where he started at 256 EV, or 47.6%. Obama, by comparison, had a better week. He started with 247 EV, or 45.9%, then sunk to his all-time low point of 243 EV, or 45.2%. Since then, he's come bouncing back. Obama now stands at a game-winning 282 electors for a comfortable 52.4%. Semi-comfortable, at any rate. Obama has reversed the slide he experienced after the Sarah Palin announcement and the GOP convention, and just as the Palin Effect was wearing off, the economy self-destructs -- which also helps Obama in the polls (since huge numbers trust Democrats with the economy over trusting Republicans). So, unless Obama really screws up during Friday's debate (if it indeed happens, that is), look for his numbers to climb next week as well, until they hit a truly comfortable plateau (that hopefully he can maintain until the election). Looking at John McCain's numbers in depth, we find more evidence that his convention bounce was what the pollsters call (forgive me for this, but it's the term they use) a "dead cat bounce" (i.e., even a dead cat will bounce once when you throw it on the floor -- now you see why I asked forgiveness for the term...). As always, Strong means 10% or better in the polls, Weak means 5% or better, and Barely is under five percent. McCain got a big spike in Strong as the week started, as Texas (and its whopping 34 electoral votes) firmed up for McCain. But then as the week went on, he lost a few in this category as well (MT, LA, NC). McCain's Strong number is currently pretty high (146, with a net gain of 27 over last week) compared to his history, but these states aren't exactly in doubt for November. But the real trendline here is the cratering of McCain's Weak numbers. Last week he was at 87, now (after going as low as 23) it stands at 38. Partly this was due to Texas being upgraded, but the line I've been watching all along as been the "Strong plus Weak" line. Last week, McCain was at an all-time high of 216 in this category, but now he slips 32 to wind up with 184 right now. Some of the Weak states went to Barely McCain, but some of them left his column altogether, meaning overall McCain is down only one point for the week. Obama's chart is certainly a lot happier than last week's. He has shored up his support in the Pacific Northwest and Mountain West (WA, NM, CO), and is doing better with states along the mid-Atlantic seaboard (VA, PA, NJ, NY). But at the same time, he appears to be weakening in the upper Midwest (IA, WI), and in the far Northeast is getting dangerously weak in Maine and losing New Hampshire to McCain for the first time. I would chalk this up to a random outlier poll, but two separate polls have shown the same razor-slim lead for McCain there, so I can't discard the evidence quite so fast. Last week I predicted was Obama's low point, and in fact it arrived the day afterwards. 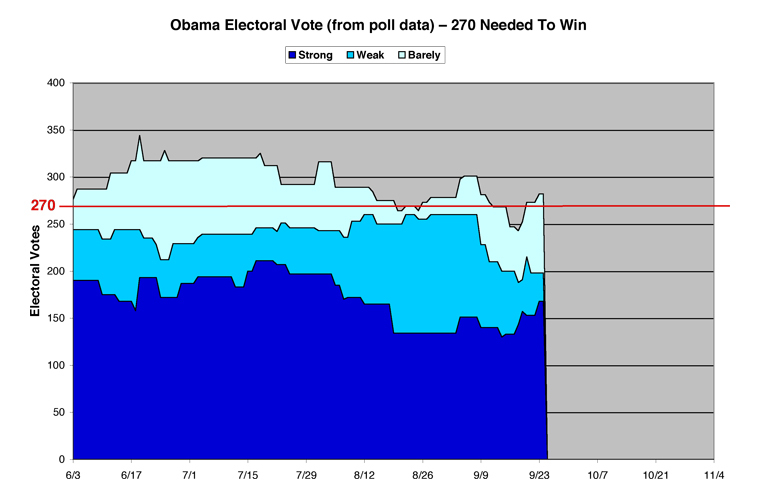 But from this low, Obama has been steadily climbing all week. He has rebuilt support among his Strong states, and held on in the Weak states. He has successfully flipped states back into his Barely column as well. But things would be a lot smoother for him if he could manage to start moving some of the Barely states back into the Weak column. I expect this to happen, most prominently in the upper Midwest (MN, WI, MI, IA) in the next week or two, since the economy is a strong point for Obama here. For the week, Obama was up 35 in Strong for a total of 168; down 37 in Weak for a total of 30, and the same 37 up in Barely, for a total of 84. But while this pushed Obama over the 270 winning line (to 282), my favorite trendline "Strong plus Weak" went down a bit, then up a bit, then settled in for a net loss of two this week to its current 198. This isn't great news for Obama, but it's not bad news either. Comparing the two candidates in Strong plus Weak, McCain was leading Obama last week 216 to 200. 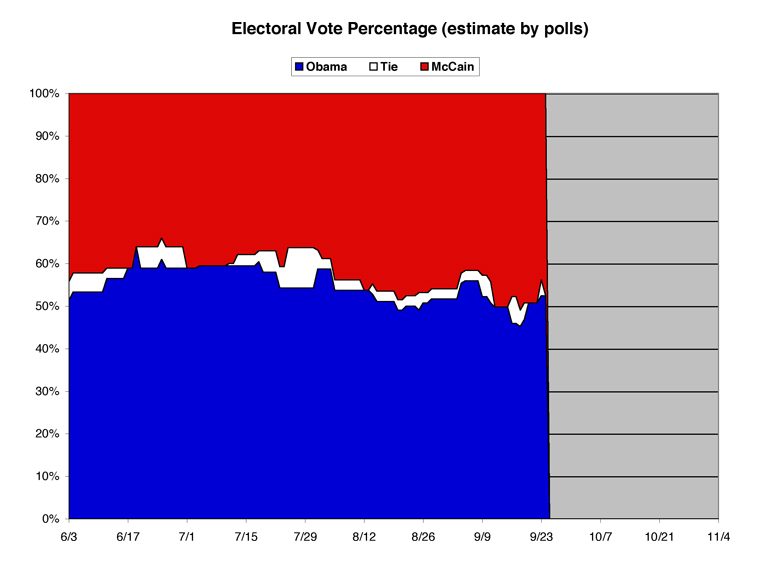 This week, Obama's back on top with 198 to McCain's 184. From a loss of 16 points to an edge of 14 points is a pretty big gain for Obama. As I said, though, it would indeed be nicer if Obama could convert a few states from Barely to at least Weak. Because I could be full of moose poop about all this, let's check in with an independent source, Sam Minter of abulsme.com. His chart averages the last five state polls, while I just take the data from electoral-vote.com, so his data is generally more stable than mine. And as a blatant plug, Minter's maps and charts are available on my webpage on a daily basis, as well. His chart combines my three charts above into one. Obama starts from the top, McCain starts from the bottom, and wherever the double pink/baby blue line currently is determines who is ahead. The lesson for today is just that small basically meaningless changes in individual states can make big jumps on the charts. This is in the nature of a winner takes all electoral college system. So when a state flips categories, great. But don't trust the sudden changes as indication of a trend... unless they last and are confirmed by other changes. Having said that, the charts are now starting to look like we really are seeing a full fledged movement toward Obama in all categories... not just movement of "Weak McCain" states to "Lean McCain". It is still early though, and there is a chance some of these changes are ephemeral. So we need to continue waiting to see if new polls confirm and strengthen this trend... or not. In the mean time, given the still huge 176 electoral college votes which are too close to call, we still have an overall election without a clear leader. And we close, as usual, with my picks. Using the polls as a departure point, I then filter it through my fevered brain and come up with what I think is really going on. Don't try this at home, kids, it can be dangerous! My categories are Likely Obama (Safe Obama and Probable Obama), Likely McCain (Safe/Probable), and Tossup (Lean Obama, Lean McCain, and Too Close To Call). Full data can be found in the data section at the end, for the wonkily-inclined. Beginning with Safe states, Obama loses Maine and Wisconsin down to Probable here, and gains Washington state up from Probable. This week's Safe Obama (15 states, 193 EV) -- CA, CT, DC, DE, HI, IA, IL, MA, MD, NJ, NY, OR, RI, VT, WA. Obama gains Maine and Wisconsin in the Probable category, both down from Safe. To make up for it a bit, he gains New Mexico up from Lean Obama. But he also loses New Hampshire all the way down to Too Close To Call. So, a mixed outcome at best. This week's Probable Obama (5 states, 46 EV) -- ME, MI, MN, NM, WI. This adds up to a total of 20 states and 239 electoral votes. This is up a single vote from last week. McCain's Safe category gained two states this week, Georgia and South Dakota, both from his Probable column last week. He lost none, leaving him at 18 states with 152 electoral votes -- AK, AL, AR, AZ, ID, GA, KS, KY, LA, MS, NE, OK, SC, SD, TN, TX, UT, WY. McCain lost two in the Probable category, both up to Safe. And he gained two from Lean McCain as well, Montana and North Dakota. Some might argue with putting Montana here, but I really just don't see it being in play at this point. Total Probable McCain this week (5 states, 37 EV) -- MO, MT, NC, ND, WV. Leaving McCain actually up from last week, with a total of 23 Likely states, and 189 electoral votes. But, again, just comparing Likely between the two candidates shows Obama maintaining a 50 vote lead. Obama needs 31 votes from the swing states to win, and McCain needs a whopping 81 -- just to put it all in perspective. Which leaves the Tossups. There hasn't been as much activity here as you might think, because I take longer to convince than a single poll sometimes. Lean Obama loses New Mexico up to Probable Obama, and finishes with two states (30 EV) -- CO, PA. Lean McCain has no states this week, losing Montana and North Dakota up to Probable McCain, and losing Florida to Too Close To Call. Too Close To Call had two additions, one from each camp. Obama lost New Hampshire and McCain lost Florida back down into the "we'll be biting our knuckles on election night" category. There are now six states that could go either way, for a total of 80 electoral votes -- FL, IN, NH, NV, OH, VA. Previous electoral math columns: [6/30/08], [7/21/08], [8/6/08], [8/20/08], and [9/17/08]. It's all voodoo to me! I just hope that next week we will see a big move towards Sen. Obama due to Sen. McCain's trying to get out of the debate on Friday. I try not to - it gives me a headache. Seriously, this just confirms - as if I need any further confirmation - of the complete and utter incompetence and ineptitude of the media and blogosphere. Frankly, I'm about done with both. I think something got cut off your last comment. It obviously meant to read: "...except for ChrisWeigant.com, an island of sanity in the moronic universe of online political commentary." You are absolutely right and I couldn't have said it better myself...call me too quick on the trigger finger. It's all Michale's fault! It's interesting because stuff like this is usually refuted immediately on Obama's Fight The Smears web site.. The "official" word is that the Obama campaign doesn't want to even dignify the rumor with a response.. But that explanation kinda rings hollow as it completely defeats the purpose of the FTS web site. I find it interesting that the newest rumors are about McCain dropping Palin from the ticket... oh, excuse me, "Palin dropping out voluntarily to spend more time with her family." These types of rumor rarely come true, but they sure are fun for those of us benumbed by following this race for the past 20 years... um, I mean, 20 months. Months. Yeah, months. It's just FELT like years, that's all.